What’s the Meaning of Unanimous? If Oconee County’s four commissioners this week decide they want to change the way the county operates through new enabling legislation, they are going to have to deal with the power of state Rep. Bob Smith and Sen. Bill Cowsert. Smith and Cowsert, neither of whom is elected solely by Oconee County voters, will determine if new legislation controlling the county’s governmental structure gets introduced in the General Assembly when it next meets. Any legislation introduced will not pass without their support. By tradition, legislators usually have required that requests for changes in enabling legislation have the unanimous support of the government officials making the ask. 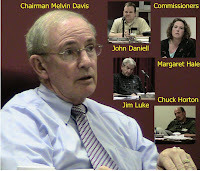 The Board of Commissioners is made up of four commissioners and a chairman. But Chairman Melvin Davis only votes in case of a tie. Does that mean that the four commissioners alone determine what changes are requested, or will Davis, who isn’t very likely to support any change in the enabling legislation that weaken his power, have a voice as well? Rep. Smith and Sen. Cowsert get to make the rules. The Oconee County Board of Education learned this lesson earlier this year when it sought to increase its own salary. Smith refused to introduce the legislation in the end, though Board members said he earlier indicated he would. Cowsert stayed in the background on that controversy, letting Smith set play king. The Board of Commissioners is scheduled to meet at 5:30 p.m. Wednesday night at the Meeting Room in the Community Center at Veterans Park on Hog Mountain Road in what is labeled a work session. As required by law, it is open to the public. Technically, the board will talk about a report produced by Harry Hayes, local government projects director at the University of Georgia’s Carl Vinson Institute of Government. The real issue is what the four commissioners, each of whom serves part time, wants to do to counter the power of Davis, whose position is full time. The structure of county government is not set by the state’s constitution, but by locally tailored enabling legislation passed by the General Assembly. In 1998 the General Assembly made the Chairman of the Board of Commissioners both the "chief executive officer of the county" and the "presiding officer at all meetings of the board." The chairman gets to "state every question coming before the board and to announce the decision of the board on all subjects," to "execute all ordinances, resolutions and contracts in behalf of the county," and to "act as ceremonial head of the county government." A departmental organizational chart for the county, given to Hayes by Davis and included in the report Hayes gave to the commission on April 7, shows Davis pretty much in charge of everything. Hayes’ report lists changes the board might make in five different areas: (1) operational communications and decision making; (2) lines of authority; (3) agenda setting procedure; (4) meeting procedure, and (5) budget procedure. None of these involves changes in the enabling legislation. The level of frustration of the four commissioners, voiced at a Sept. 25 meeting with Hayes, suggests they may not be satisfied with anything less. Commissioners Jim Luke, Margaret Hale and Chuck Horton said they have tried repeatedly to make changes in the past without success. Commissioner John Daniell, whose term started only in January, did not participate in that discussion. The complaint of Luke, Hale and Horton was simple. They said Davis, through his control the department heads, keeps them from getting the information they need to do their jobs. The challenge before them now may be convincing Bob Smith and Bill Cowsert to do something about it. Party won't play a role here. Cowsert, Smith, Davis and the four commissioners are all Republicans.